What is Durapet Dish & Durapet Bowl? A Durapet Premium Stainless Steel dish and bowl are highly durable with a lifetime guarantee. Each bowl includes a permanently bonded rubber ring on the bottom to resist sliding and making noise on hard floor surfaces. Each Durapet dish and bowl is made of high quality stainless steel and is dishwasher safe. 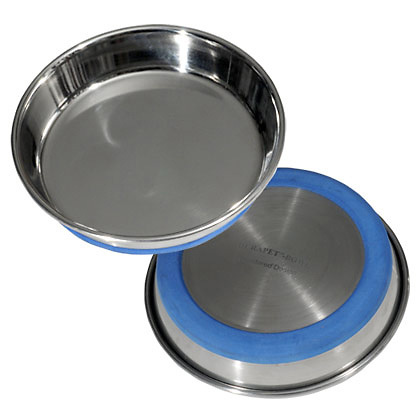 Fill the Durapet Premium Stainless Steel dish or bowl with your pet's food at feeding time. Avoid overfeeding by reading the pet food label for recommended feeding dosages. Feed your pet 1-800-PetMeds'Chicken Soup for the Dog Lover's Soul Adult Dog Dry Food, an all natural pet food for dogs. See above for individual product instructions/dosages. Store these products at room temperature. Product Materials: Stainless steel, Rubber coating (bottom of dish).